Jo Yakimowski started square dancing in 1973 with the Spares `n Squares in Milton, MA. Archie Howell was the caller. Jo’s mother saw an ad in the paper and said it would be fun since she had gone with Charlie Baldwin during World War II down to the Cape to square dance with the servicemen. Jo went kicking and screaming to the dance. But when she came home she told her mother she would try just one more time. At that dance, Archie Howell asked her to come over to Garden City Squares in Newton, MA, because he had dancers that were more her age. During the gas crunch of the 1970’s Jo saw Round Dancing and decided that she would like to try it. So she went by public transportation to Charlestown, MA where Frank Campbell was giving lessons. She was the only single in the class. Since she didn’t have a partner, and because she liked to sing, she decided to learn to cue rounds. That way she could be part of the square dances. The rest is history. Thirty-six years later, Jo is still doing a beautiful job of cueing rounds. She travels far and wide doing this. She has attended and taught rounds at 22 National Square & Round Dance Conventions, initiated an “Introduction to Round Dancing” at the New England Square & Round Dance Conventions. Jo has conducted Pinnacles Round Dance Leaders’ School and many weekends. She also taught at 4 Canadian Square & Round Dance Conventions. She has been a panelist at many conventions, National, New England, & Legacy. Her list of achievements is long. Contributing Editor to the Northeast Square Dancer Magazine, Past Roundalab Classics/Round of the Quarter Chairman, Past Founder and Editor of The New England Round Dancer Leaders’ Newsletter, Past President & Secretary for Mayflower Round Dance Teachers Association, Past President of SEMCA, just to name a few. Jo is a charter member of Roundalab, and is a member of the Vermont Round Dance Teacher Association, NECORTA, and SDFNE. Her community involvement is also stellar: Next month she will be the 2″d Vice President of the Dept. of Massachusetts American Legion Auxiliary. She has held many positions in this organization. Jo is a past Secretary of the Friends of the Council on Ageing. As you can tell, Jo likes to keep busy, and enjoys helping others. 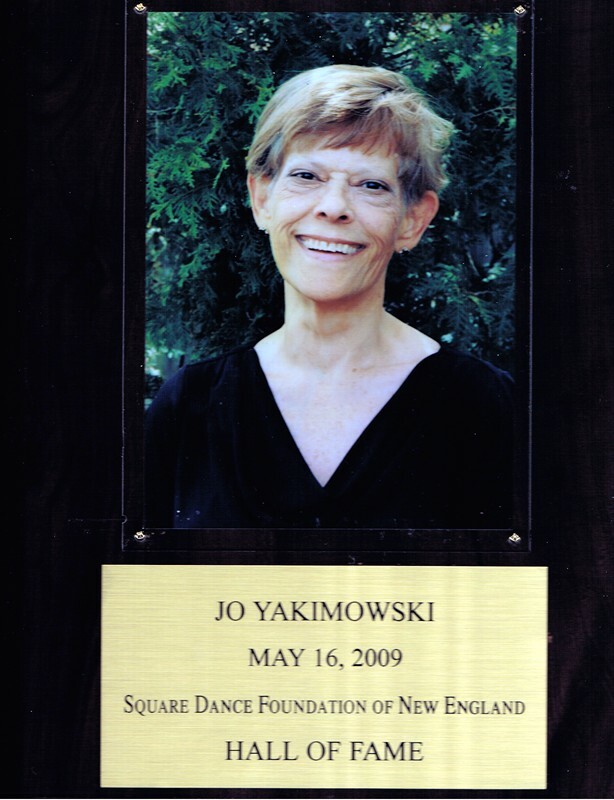 We are pleased to induct Jo Yakimowski into the Square Dance Foundation of New England’s Hall of Fame.